Those who liked this blog, may also like … satire? Quick – how did your crew decide where to eat out last time? Place you saw walking down the street? OR did someone suggest a place they heard about…online? For most of us, most likely, the latter. That’s because a lot of our decisions are made for us before we can even think about it. It’s called “Collaborative Filtering”, and it’s the little thing you see that tells what “others were also interested in.” Like when you’re looking for something on Amazon, and they just magically know what else you’d be looking for. Two creatives from New Zealand zeroed in on this behavior, but wanted to do it with a twist, reversing the ‘digital’ nature of the habit. This clever duo put up ACTUAL additional recommendations, on a physical board, in stunning, natural places. Seems tongue in cheek right? Leveraging a familiar web-reco platform, but in a dis-connected, non-digital, well, NATURAL way. 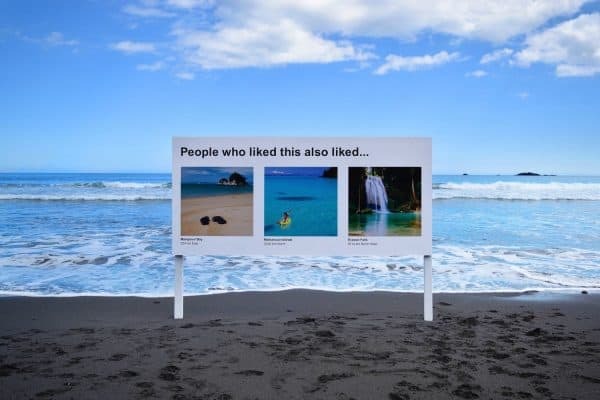 Signs printed with the familiar ‘…also liked….’ copy and lush pictures were staked into spots where people not only go to enjoy natural beauty, but also go to get the perfect, Instagrammable pic. Selfie-mockery, anyone? But this execution doesn’t seem to be too rude, in a thinkin’ for yourself – NOT!’ kind of way. Sure, it points out the formulaic, and digital predominance in our lives. But it also offers up more solutions, for the like minded naturalist. And at best, seems to be simply an artistic and amusing way to play up the continual convergence of physical and digital, all day, in all ways. What’s the next step in collaborative filtering? Soon maybe we’ll all be wearing terminator glasses, but instead of zeroing in on enemies, it’ll simply suggest a fellow-foodie brunch spot. Oh wait — that’s Google glass. Never mind.